The Glenmorangie single malt whisky expression Glenmorangie Dornoch is to be available as a worldwide exclusive to World Duty Free Group (WDFG) from November 26 for a two month period, before being released to the wider travel retail sector. 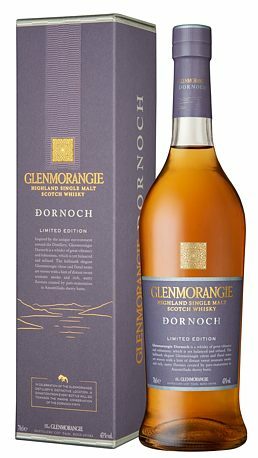 Glenmorangie is Gaelic for 'the glen of tranquility’ and the Dornoch expression was inspired by the distillery’s peaceful setting on the banks of the Dor noch Firth in the Scottish Highlands. The packaging was designed by ButterflyCannon. The limited edition bottling will be exclusively available in WDFG’s specialist World of Whiskies stores and its World Duty Free stores, in all 21 UK airports in which it operates. To protect the environmental importance of its provenance, Glenmorangie has formed a partnership with the Marine Conservation Society. A donation from each bottle of Glenmorangie Dornoch sold in the travel retail sector will be made to the Marine Conservation Society to help sustain and protect this beautiful estuary beside the distillery for future generations, as well as helping to protect Scottish and UK seas more widely. Dornoch is chill filtered and bottled at 43%ABV. It will be exclusively available in all World Duty Free and World of Whiskies stores until January 30, 2015, and will feature as ‘Malt of the Month' during December on WDFG’s dedicated World of Whiskies website. Distribution will then be extended across other European travel retail outlets from February 2015, with an RRP of £59.99.